Growing up on her family’s dairy farm in South Carolina Dr. Ann was exposed to many facets of animal care from an early age and can truly say that she knew she wanted to be a veterinarian her whole life. After receiving a Bachelor of Sciences from Clemson University in 1987, she attended University of Georgia College of Veterinary Medicine, graduating with her Doctorate of Veterinary Medicine in 1991. 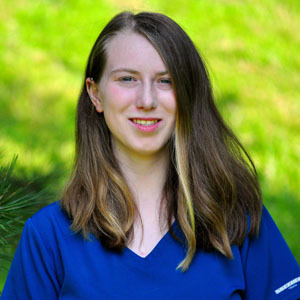 After graduating, she spent her first few years of practice at an AAHA certified small animal practice in the Raleigh/Greensboro area. It was during this time that she became interested in holistic medicine and completed the Professional Course in Veterinary Homeopathy taught by Dr. Richard Pitcairn in 1998. 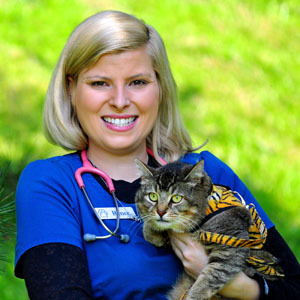 Dr. Ann and her family moved to Brevard in 2003, and she worked for several years at the Humane Alliance Spay/Neuter Clinic in Asheville. In 2008, she completed the Chi Institute’s Small Animal Acupuncture and Chinese Medicine Course and opened Riversong Veterinary Clinic in downtown Brevard. Since then, she has enjoyed using her specialized training and over 25 years of veterinary experience to offer integrative services to local pets. 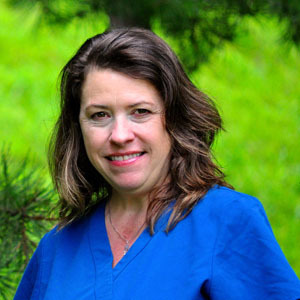 Dr. Ann is a current member of the American Veterinary Medical Association (AVMA), and the American Holistic Veterinary Medical Association (AHVMA). When not busy with her duties as Owner and Veterinarian at Riversong, Dr. Ann enjoys hiking, biking, gardening, and spending time with friends and family, including her furry family members Valentine, Joles, and Abe. Kristen joined the Riversong team as the office manager in December 2015. 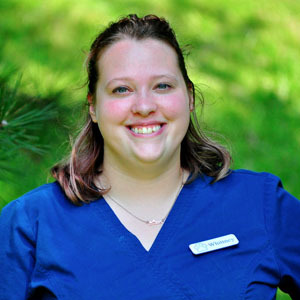 Kristen is passionate about providing quality care for both patients and clients at Riversong. At home, she stays busy with her two active rescue dogs, Tess and Eamon, Branna the cat, as well as two turtles, rabbits, and a flock of chickens. 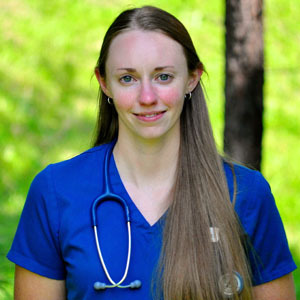 Renee is a graduate of the University of North Carolina at Asheville with a Bachelor’s degree in Sociology, and also graduated from AB Tech’s Veterinary Technology Program and went on to become a registered technician. Renee joined Riversong in July 2014 and is an essential team member involved in many aspects of procedures, patient care, lab work, and client education. At home, she enjoys walking with her sweet rescue cat, SC, and her Italian Greyhound, Sandy. Hannah first came to Riversong as part of a program through Brevard High School. At the end of the course in June 2018, she stayed on at Riversong as a part-time assistant. Hannah is currently studying at AB Tech and enjoys spending time with her dogs and riding ATV’s. Whittney joined Riversong as an assistant in January 2018. She is currently enrolled at AB Tech and is working towards becoming an RVT. At home, Whittney enjoys hiking, reading, and spending time with her four-legged pack which includes rescue dogs Bella, Rascal, and Daisy, and her cat Jinx.